It’s not even a used copy. It’s a brand new copy of the game on PlayStation 4 or Xbox One, and all you need to do is buy a used, official controller from either system. Fallout 76 was originally retailing for €70 (it’s now been slashed to €30), while a new DualShock 4 is €53, so used ones are obviously cheaper. 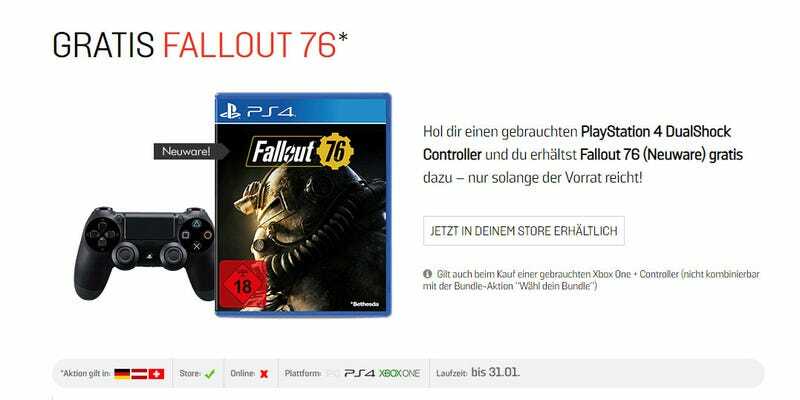 GameStop aren’t the only German retailer having trouble moving the game, either; the big electronics chain Saturn are also giving copies of the game away with the Fallout 76 Xbox One bundle. Meaning you’d get an Xbox One, a copy of Fallout 76 and then…another copy of Fallout 76.